This extraordinary four-bedroom home showcases a Master Suite so elegant it demands its own wing. 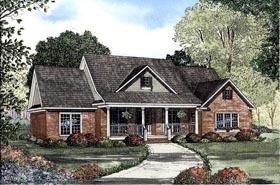 You'll have a tough time deciding where to entertain with two impressive Covered Porches and a delightful Great Room offering the comfort of a cozy fireplace. The Foyer opens to the Dining Room with an elegant eleven-foot boxed ceiling and to the Optional Study with bookshelves. The Master Suite showcases a nine-foot boxed ceiling and includes a Bathroom with two walk-in closets flanking a whirlpool tub. A Bonus Room is available upstairs for future needs. Question: Do the plans show the roof pitches? Does the floor plan have a scale on the floor plan? Answer: The final plans do contain all of this information.